A state lawmaker hopes to curb the sale of alcohol to minors by targeting self-serve scanning stands at supermarkets and preventing people from cheating the system. The grocery industry says its customers love the self-serve checkout service, and there’s no evidence the new technology helps kids buy alcohol. A growing movement says it does. 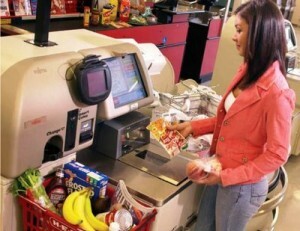 More and more grocery stores are using self-serve checkout stands. At Fresh & Easy Neighborhood Market stores, for example, the registers are completely unmanned, with a worker stationed nearby for help. At certain times, though, minors are able to buy alcohol, even though the self-serve stands are supposed to freeze and alert workers to check customer identification. “When the store is really busy, it’s just impossible to keep track of what’s going on with all those registers,” said Lisa Austin, a Fresh &Easy customer assistant. There are ways to cheat the system by quickly scanning the next item or sliding a credit card for payment before the freeze happens. There also have been instances when a six-pack of soda is scanned, but a six-pack of beer is bagged.